There’s nothing better than relaxing on the beach with your loved ones, that’s why we’ve rounded up 10 of the top family beach holidays for 2018. Our list of balmy beach destinations includes cool coastal hangouts Croatia, Ibiza, Algarve, Malta and more! Browse our list of must-visits this year and indulge in award-winning beaches alongside awesome surf, exciting nightlife, ancient ruins and delicious food. If you’ve got the tots in tow, you may want to read our top travel hacks for keeping the kids happy on family holidays. Disclaimer: All Teletext Holiday packages assure quality amenities, awesome pools, and sun-kissed beaches! Yep – you read that right! Ibiza is synonymous for it exotic clubs and never ending parties, but did you know that the island also has a calm side? It’s actually a perfect destination to spend quality time with your family. The Balearic island of Spain isn’t just a place to leisurely let your hair down, it’s also a place for couples and families to enjoy a chilled-out sunshine holiday. Cala Llenya is a lovely beach resort flanked by pine trees and gently sloping sands, making it an ideal choice for beachside picnic or a quick swim. For the more adventure seeking bunch, Ibiza is filled with lively resorts that offer parasailing, paddle boarding, snorkelling etc. Es Cana, Cala Llonga, and Playa d’en Bossa are where you’ll find watersports like paragliding, wind surfing, riding inflatables, water skiing, diving, etc. Kids will absolutely love the Aguamar water park at Playa d’en Bossa. Palma Nova is a town with popular sandy beaches, cool boutique bars and shops. However, the real reason it’s topping our summer holiday charts is due to its family-friendly beaches - most of which are Blue Flag certified. The beach town boasts a lively atmosphere and is filled with activity centres and watersport centres for children. The town is hive of activity and has a promenade of shops where tourists can purchase hand-crafted jewellery, trinkets, and fine leatherwork. If you’re feeling sporty, indulge in a round of golf at the nearby Golf Fantasia, or feel the need for speed at the Go Kart track in neighbouring Magaluf. #funfact: Agatha Christie was inspired to write a collection of short stories after her stay here at Palma Nova. The walled medieval city of Dubrovnik is a hot topic when it comes to family beach holidays. Boasting a mixture of gorgeous beaches and ancient cobbled towns, this enchanting destination in Croatia, on the Eastern Coast of the Adriatic Sea, is popular with children, adults, friends and couples. Game of Thrones fans will love touring the Old City (the film set for King’s Landing) while adults can admire the history and culture – plus a few ruin bars too. Copacabana is one the most popular beaches here, with shallow water ideal for swimming with the kids and activities/facilities including water chutes, inflatable banana rides, and paddle boats. For older children, activities like kayaking, snorkelling, cave exploration, etc. are also available across the island. The beating heart of Portugal’s beautiful Algarve coast, Albufeira is where all the beach action happens. Its blue-flag stretches are perfect for families travelling with children, with bundles of watersports, surfing and nearby food and drink spots to cool down in. When you’re not basking on the cliff-backed beaches, explore the resort’s whitewashed Old Town, horseshoe marina, ancient ruins of Cerro da Vila, or – if you’re feeling adventurous – swing from the trees at family-friendly Luso Aventura Albufeira! Possibly an underrated attraction in Albufeira is dolphin spotting. Families can take tours to see dolphins, whales, and other marine life in their natural habitat. #funfact: Some beaches here are only approachable through water! Once a fishing village, this bustling town of Los Cristianos is located on the southern coast of Tenerife. It’s extremely family-friendly with a surfeit of cafes, restaurants, ice-cream parlours, and a palm tree-lined promenade. There are two stunning beaches and plenty of water activities to choose from on Los Cristianos holidays. Activities like scuba diving, snorkelling, surfing, windsurfing, kitesurfing, kayaking, canoeing, etc. help keep families entertained from dusk until dawn. Nature lovers can book wildlife tours, hiking & camping tours, dolphin & whale watching, boat tours, fishing charters, etc. The evenings here are laid-back and focused around cafes that spill out onto the pavements. #Tip: If you are visiting Los Cristianos for the first time, make sure you stopover at the Loro Park and the Siam Park waterpark – these are the best in Europe! A rather small and quiet village in the island of Malta, Mellieħa has a charming character that leaves families enthralled. The beach village is filled with numerous picturesque scenes and one of the most beautiful beaches in Europe – Mellieħa Bay. Situated on the top a hill, Mellieħa offers beautiful panoramic views of the beaches and the valleys. Families can feel like a movie star when they visit Popeye Village, an entertainment park that’s based on the 1980s Popeye movie, with film-sets, activities and a nearby lagoon and beach. Other fun family oriented activities include, boat tours, nature & wildlife tours, watersports (the not so extreme kind), fishing charters & tours and even segway tours. This southeastern Mexican city is a world of its own – mostly because Cancun enjoys clear skies with radiant beams of sunshine for almost 300 days a year. Surrounded by the Caribbean Sea, the city features soft ice-white sand and calm, florescent blue waters. Families that want to spice things up can literally do so at one of the cities many restaurants serving local, delicious Mexican cuisine. In addition to these, there are many tasty taco joints for when you feel like grabbing a quick bite. When you’re not lounging on the beaches, Cancun is a hive of activity with attractions such as Dolphin Discovery and Delphinus, adventure trips to Xcaret Zoo and Themepark in Isla Mujeres and a medley of awe-inspiring cenotes to swim and snorkel in dotted around the resort. Downtown Cancun has many colourful souvenir shops where tourists can pick up trinkets, panama hats, pottery, sarongs, traditional Maya dresses and handmade jewellery. Visit in the evening and experience a round-up of live music bars, eateries and salsa bands. #funfact: Did we mention that Cancun has an underwater museum? MUSA is a one-of-a-kind aquatic museum featuring over 500 life-size sculptures. The pretty resort of Rethymnon, Crete, is a unique place to visit. Ask any local and they will regale you with the town’s tangled history, particularly the hotch-potch 16th century Old Quarter, brimming with character. A popular must-see is the resort’s charming Venetian harbour, lined with bobbing fishing boats. Rethymnon has many untouched and exotic beaches to offer too, with some of the most beautiful turquoise waters in all of Crete. The sands are long and white-blonde here – a Rapunzel’s ponytail snaking along the North coast for more than 12kms; plenty of room for your bucket and spade! The picture-perfect town is a great choice for families that aren’t too keen on high-rise hotels as a holiday backdrop. Kids will love exploring the old fortresses and the nearby nature park, or explore the Themeparks and Aquaparks with the kids. This beach province in the west coast of southern Thailand is nothing short of spectacular! If you’re looking for a cheap all inclusive family holiday amidst sun, sand, and scenic islands, then look no further than Krabi! The best thing about this exotic beach destination is that it’s the most relaxing resort in all of Thailand. It has some of the most stunning beach scenery imaginable, 200 small islands waiting to be explored, and to top it off – a well preserved jungle. Ao Nang, Phi Phi and Klong Muang are just a couple of places where families can enjoy the fabulous scenery, clear turquoise waters, and fantastic soft sand beaches. For the more adventure seeking bunch though, activities such as boat trips, snorkelling, kayaking, cave exploring, rock climbing and visit tiger and elephant sanctuary’s are all available. #tip: Don’t forget to take a dip in the Klong Thom Hot Springs! Paris is instantly recognisable for its iconic architecture, glorious food, artistic treasures, and stylish shopping avenues, which give the city its status. Better still, this European star is also one of the most child friendly cities in the world. Despite its high fashion boutiques and mesmerizing nightlife, Paris has some of the most creative, functional, and old-fashioned things to do and see for entire families. 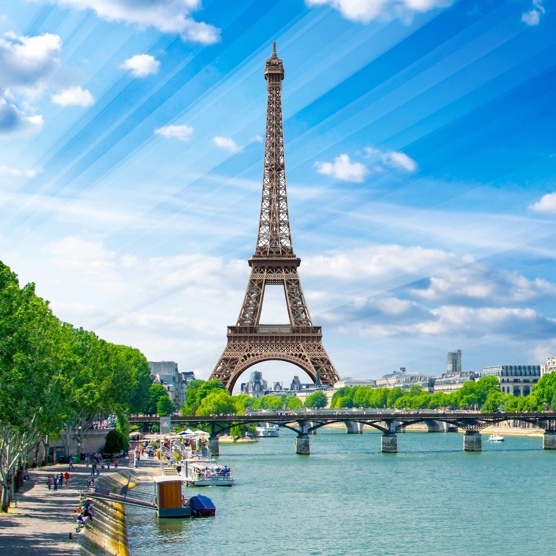 There are three science museums, eight breath-taking parks, an Equestrian Show at Versailles, the Aquarium de Paris Cinéaqua (which has 500 odd fish species and a shark), the state-of-the art Parc Zoologique de Paris, and much more. For more mainstream things to do, families can head to the Louvre, Notre Dame, the Catacombs, the Eiffel Tower, click pictures of the Arch de Triomphe, or take a walk on the banks of the Seine. Not to mention indulging in the city’s delicious croissants, omelettes, crêpes, ice-cream, and chocolate shops lining almost every street corner. With some of the best winter sunshine and a dazzling array of luxury hotels, Dubai never fails to amaze! Some of the prominent features of this city are the Burj Khalifa, Burj Al Arab, the Palm Jumeirah, The World Islands, the Dubai Marina, and Sheik Zayed Road. The sunshine here averages about 295 hours a month (750 in total). This is more than the 125 hours of average sunshine that the entire United Kingdome gets in a month. Also the probability of sunshine is 78%! If yours is a family eager to spend time in the sun, then Dubai is the perfect family holiday destination for you! Families with children travelling to dubai can visit the world-class aquarium, swim with the dolphins, hit the slopes at the indoor skiing centre (with real snow!) or simply stick to the amazing beaches and award-winning waterparks! Find cheap luxury Dubai holidays that will please adults and tiny tots alike. #tip: Most of the beaches and beach resorts here operate kids’ clubs. Did you notice that we’ve mentioned Italy and not any of its cities? Italy could easily be one of the best baby-friendly holidays abroad, with all-round resorts and family run restaurants and bars. With the Naples Riviera offering great beaches and the cities of Venice, Rome and Florence a treasure trove of city break shopping, food and ice-cream, you can enjoy so much in this beautiful country. If you want to visit just one city and experience Italy in its entirety, then Naples is the place for you. It’s built right on the water making the views and scenery even more spectacular. The city has many historic sites and art works to offer along with a dash of shops, restaurants, and bars/clubs. Paphos is a sunny, family beach destination due to its warm weather, fabulous beaches and laidback Cypriot lifestyle. We say family beach destination because the city is filled with a myriad of Blue Flag Beaches and excellent year round climate. Families can explore the Byzantine-era ruins or visit the massive amphitheatres from a bygone era. The city’s hospitality is extraordinary along with its food offerings, making it a top choice for families. If you don’t like spending too much time on the beach, head over to the beautiful boulevards for a stroll and sit down at a tavern to relish amazingly tasty Cypriot cuisine. Some fun places to visit along with children are the Aquarium, St Elias Church, and the Ay Anargiri cave church in Protaras; the Waterpark and the statue park in Ayia Napa. Children can also ride horses on the beach and/or visit the paleontology museum or the interactive Archimedes museum. Sitting proudly on Turkey’s famous Turquoise Coast, Marmaris is great for families vacationing with kids. The city offers a wide array of entertainment, bars, family friendly restaurants and hotels to suit every budget. The beaches here are splendid and are some of the best places for families as a whole to splash around in the warm and safe waters. There are waterparks, a dolphin park, quad & buggy safari, and a go karting track to choose from. Don’t miss the dancing fountains in the town square or a day out at the Atlantis waterpark. If you fancy a change of scene, you can stroll along the pretty promenade all the way to Icmeler – or why not catch the ferry to Rhodes? Idyllic village-style resorts nestled amidst turquoise waters, scattered across the Indian Ocean; Maldives can be the ultimate destination if you’re looking for fun holidays in the sea and sun. Often considered as a honeymooner’s paradise, the Maldives has quickly rebranded itself into a fun family holiday destination. The islands host some of the most inspiring and imaginative programmes for children, which include dolphin trips, coral adoption schemes, etc. Children can also enjoy themselves in the many water activities offered on the islands. Most hotels here have exciting menus for children, and activities and games at the Kid’s Club to occupy them. #funfact: There are some spas here cater only to children!